Tripp Lite's Power It! TLM606NC power strip offers a convenient method of power distribution for appliances, power tools, lighting and other electrical equipment. Includes 6 NEMA 5-15R output receptacles with 1.625 inch center-to-center spacing, 6-foot AC line cord and keyhole mounting tabs for installation in a wide variety of applications. 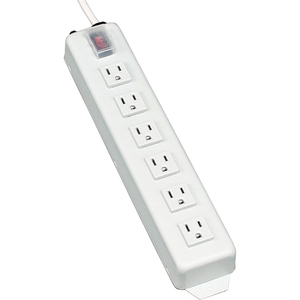 Corded, multi-outlet strip reduces cable clutter and enables the connection of multiple electrical devices to a single AC wall socket. Unfiltered electrical pass-through makes TLM606NC ideal for distributing alternate waveform UPS or generator power. Features rugged all-metal housing to stand up to the most demanding environments, lighted power switch with transparent guard to prevent accidental shutoff, 15A resettable circuit breaker and attractive white color scheme.